DISCONTINUED. This model has been replaced by the Canon 50D. XNiteCanon40DIR : Dedicated IR-Only. 715nm or 830nm. 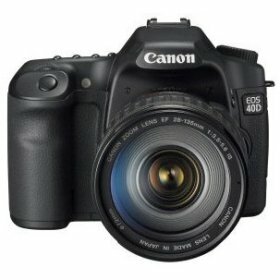 The Canon 40D is a professional digital SLR camera. Because of the nature of the IR enabling modification, we do not recommend this camera to anyone who does not fully understand the implications of the modification. Note: Spectral Response Curve for the 40D is now available!. We can modify this camera to be UV+IR+Visible or IR-Only. An IR+Visible camera will see both Infrared and Visible light after modification. IR Only cameras have the option of being setup with an internal 715nm or 830nm filter. An IR-Only 715nm camera will only see IR from 715nm through 1200nm. The IR-Only camera has an internal 715nm IR filter with an antiflection coating. The 715nm filter performs similarly to the Hoya RM72 and Wratten 89B. An IR-Only 830nm (87C equivalent) camera will see IR from 830nm through 1200nm. Because the 830nm sees less light, you will lose about 2 F-Stops. You will gain a higher resolution picture because the RGB channels will be more closely balanced. Because camea sensors have 1 red, 1 blue and 2 green pixels for every 4 pixels, and because the red channel is the most open to IR, with a 715nm filter, about 65% of the image comes though the red pixels. Thus, 65% of the data is coming in on 25% of the pixels. With an 830nm filter, the channels are much better balanced because of the way the mosaic color dyes on the sensor open up in IR. When the channels are better balanced, the camera can resolve better. We can modify your Canon 40D for a $450 fee + return shipping & handling ($20 for UPS ground insured within continental USA).